When I think of beets I am reminded of how my mom used to can them as pickles and then put peeled, hard-boiled eggs in the jar of liquid remaining after the beets had been eaten. We loved those red-beet eggs. Mom would also dice up the beets and sauté them in butter and season them with salt and pepper. I think she would like this roasted beet salad topped with blue cheese and walnuts. Beets and Swiss chard are in the same plant family and the beet tops can be prepared the same as Swiss chard, although in my opinion, the beet tops have a bitter bite to them. Beets are full of nutrients and health benefits and as I recently learned they have a high boron content that the ancient Romans took advantage of as an aphrodisiac. Hmm…. that is an interesting bit of trivia. Beets will keep in the refrigerator for several weeks, do not wash them but just wipe off the soil, wrap individually in a paper towel and store in the vegetable drawer. 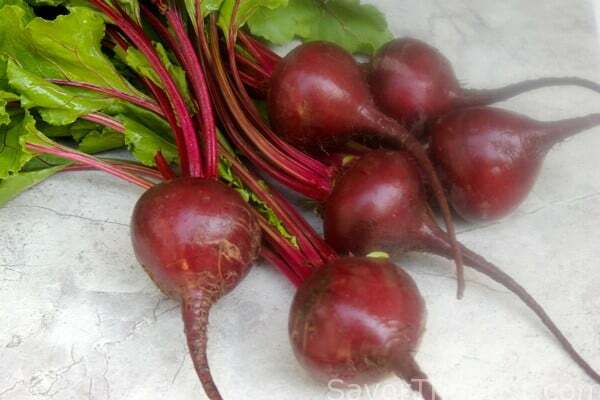 You can find beets, or grow them, in a variety of colors such as gold, orange, white, or striped like candy. If I ever spot some white beets I am buying them. Usually the red beets are the ones I buy but the yellow and red beets sautéed together in a little butter and sprinkled with fresh dill, salt and pepper is especially delicious. Plus mixed together they make a beautiful side dish presentation. 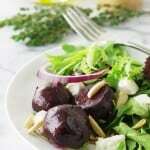 I particularly enjoy the red beets roasted and served in a salad. This is how I do it. 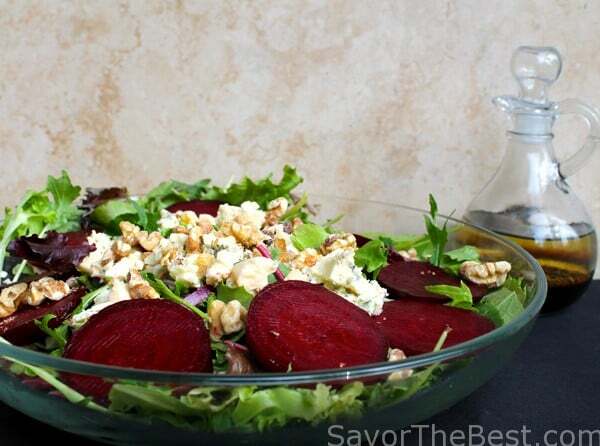 Crisp salad greens with roasted beets, blue cheese crumbles and walnuts, dressed with a balsamic vinaigrette. Cut the beet tops off of the beet roots to one inch and discard. Do not cut the root end, scrub the soil off the beets and dry with a paper towel. Place the beets in a zip top plastic bag with the oil and roll the beets around to coat them well with the oil. 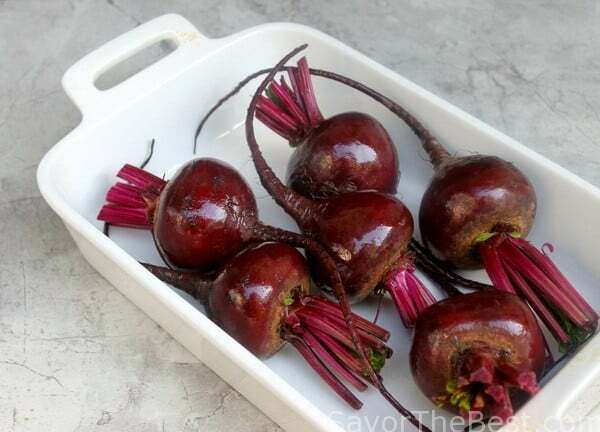 Place the beets in an oven-proof dish and transfer to the middle rack of the oven. Roast them for approximately 45-60 minutes, depending on the size of the beets, or until a sharp paring knife shows just a little resistance when inserted into the beet near the top. They should be tender but not mushy-soft. Remove and set aside to cool. When beets are cool enough to handle, trim off the remaining top and the long skinny, rat-tail root. With the back side of a table knife, push or lightly scrape the skin off the beets. I do this under a stream of cold running water. 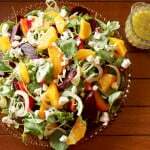 Add the salad greens to a large bowl, drizzle 4-6 tablespoons of the vinaigrette on the greens, toss to combine. Top the dressed greens with the onion slices, crumbled blue cheese and toasted walnuts. Arrange the sliced beets on the top and serve immediately. 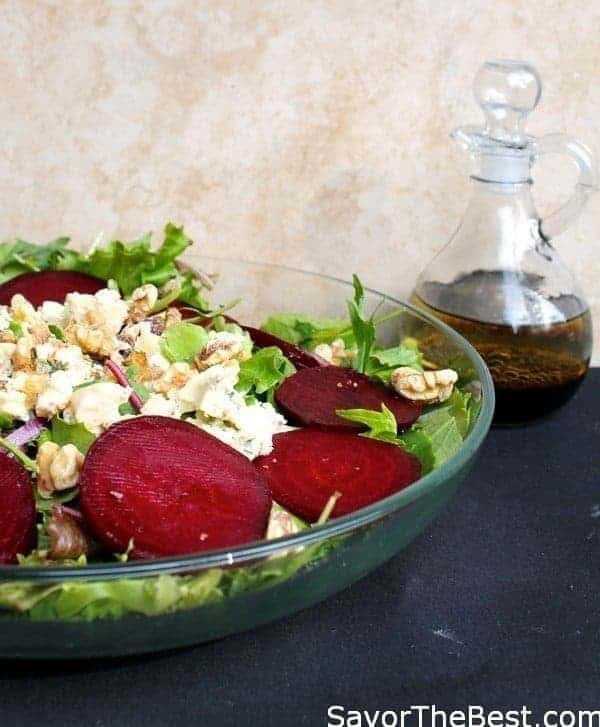 Alternatively, divide the dressed greens onto six salad plates and top each with the beets, cheese, walnuts and a drizzle of the dressing. In a small jar, combine the vinegar, and garlic and the olive oil. Season with salt and pepper to taste, put the lid on the jar and shake it up to combine. I had beets in a salad like this years ago in California and fell in love with the combo. And, come Fall, a friend and I schedule a full day to pickle and can beets. With that said, can you please pass me that salad? Great photo. 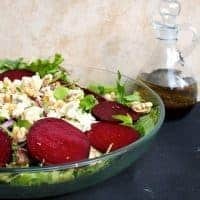 I love roasted beets but I’ve always made this salad with pickled roasted beets. I’ll give this a try without the pickling!